Backyard patios are the best leisure, recreation, and party place for homeowners. It is the place often used for various activities and grabs the attention of family members as well as guests. So, the right buildup of patios is essential for utilities, aesthetics, beauty, and usability. Today, we have myriads of options to create patios and decorate those as per needs. Out of a couple of options, natural stones is a prime selection for the fans of natural beauty comes with natural material. Apart from this, natural stones come with some advantages over the other materials for exterior paving and decorations. World of Stones is a leading supplier of natural stones for exterior applications in the Maryland, USA. Today, expert consultants at World of Stones is going to give you the top ten reasons for that you can choose natural stones paving for your backyard patios. We know stones are unique in every aspect from each other. Why? It is the law of nature. Do you know about fingerprints? Out of billions of people, you never find fingerprints of two humans similar. So, you never see two pieces of stones alike in nature. A vast diversity of colors, tones, patterns, designs, styles, textures, and materials occur in the natural stones. It is almost impossible to mimic in manufactured materials with artificial pigmentation. Therefore, the natural beauty of stones is always touching our sense and triggers various feelings in the minds of onlookers. 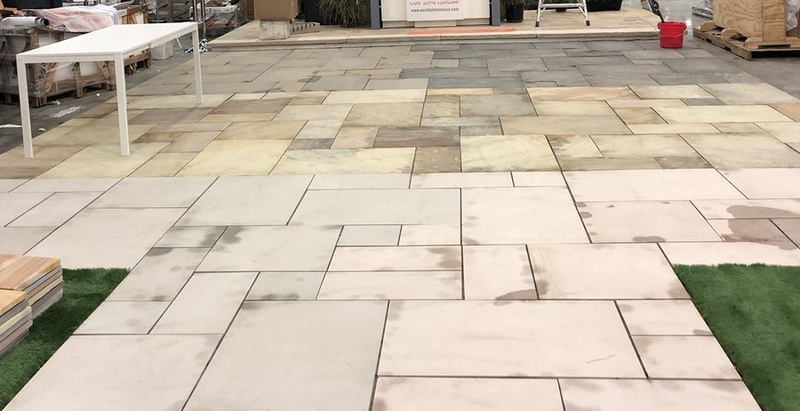 In manufacturing tiles and concrete-based pavers, you have to rely on the manufacturers to provide you with diversity in material choice, and it is limited in most of the cases. Natural stones have different origins so differ in types a lot. Stone properties are inherently different in various attributes such as colors, shades, tones, texture, patterns, and so on. Moreover, you can cut stones in desired shapes and sizes to fit in your projects. Stone carving is an art, and best craftsman can deliver you classic to contemporary products using on-site fabrication tools. Today, quarrying technologies advancing enough to provide you with sophisticated products within shorter timelines. In most of the cases, quarries and finishing units have a huge inventory ready to ship or send to you via various routes to your doorsteps. Bulk orders also cut the costs in a great deal. Moreover, importers, retailers, distributors, and suppliers of natural stones in USA are rapidly increasing in numbers. It makes the availability of a wide variety of stones in any corner of world easy and instant. Competitions have cut the shipping or delivery cost a lot. Wood material has a limited life and getting scratches, gouges, or chips within a shorter duration than any other material, particularly against the stones. Similarly, concrete and manufactured tiles are poorer in strength than stones. Natural wears and tears damage all materials rapidly except natural stones of quality material. Natural stones are sturdy by nature and can bear heavy load if you have proper sizes and shapes applied for your patios, paths, and driveways. Sandstones, granites, slates, limestone, and similar types of natural stones can withstand superbly against natural calamities and weather changes keeping its usability and appearance intact. Cleaning and maintenance of natural stones are quite comfortable in any season, be it a rain or snow a handful of cleaning tools are enough for any scale of exterior spaces. You can finish stone in different qualities and types. Thus, you can obtain a bit rough to fine-grained or well-finished surfaces for your natural stones. For open spaces, you can install non-slippery stones to save from any mishap during rainy or snowy seasons. Siliceous stones are heat and cold resistant toa greater degree than calcareous stones. It makes life easy on your patios or walking comfortably on garden paths during hot summer days. We know calcareous stones like limestone and marbles are porous by properties while siliceous stones are less permeable. In the absence of adequate porosity, stones are not passing water molecules or water vapors from one side surface to another. Thus water resistant types of stones get dry immediately once the proper cleaning is applied. Same the way, in humid regions or lands, underground humidity is hardly come on the surfaces of your patio or paving paths if moisture resistant stones have applied there. It keeps the stone from permanent damages by humidity as well as maintaining its natural appearance intact for a long duration. Stones are the most sought after building material. Stones give decent look-n-feel to your property while applying externally along with interiors. Trends of stone materials, styles, and patterns are evergreen means remaining forever and never goes out of style. Moreover, the beauty of stones becomes prominent over the pace of time with time-worn effects. These all factors are increasing aesthetic and beauty values of your properties. Thus, you can get high value when you go to sell your property at any moment in the market. Stones are purely a natural product yielded by nature itself. It never contains any hazardous chemical, components, gases, and elements. No other human-made material can withstand against safety and security come with natural stones for the health of users including humans and animals. It requires only cutting and polishing. Fortunately, World of Stones like suppliers in the USA is using natural or green energy by installing wind turbines in the manufacturing units. It made the product completely green-labelled leaving no trace of environmental degradation at all. Moreover, natural stones are recyclable material and frequently used in its lifespans which may last for centuries not decades! Apart from the mentioned advantages of choosing natural stone for your patio or exterior constructions, several case-specific pros and cons is a possibility. If you want to know more regarding it and the best services a reputed stone supplier can provide you, consult World of Stones in Maryland, USA. You will get high-quality stones from local and international quarries at highly competitive rates. The stone inventory consists of the majority of stone types. You can select colors, textures, patterns, and styles out of the vast collections of each type. World of Stones, USA provides complete guidance right from installation to maintenance and renovations of your exterior stones. It’s really a great and helpful piece of info. I am satisfied that you shared this useful information with us. Please stay us informed like this. Thanks for sharing. This is some really good information about natural stone paving. I ‘ll keep for my future use.